A monthly delivery course is a service to deliver Fall in Eyez(R)colour contacts every month. All colour contacts of Fall in Eyez(R) are available. You can save a lot of trouble every time when you purchase and get a product at a small price! Now we would like to explain how reasonable the price is. We understand that you might get interested in trying other colour contacts whilst using a monthly delivery course. ※We accept the change of colour contacts within 10 days since the product has been delivered. 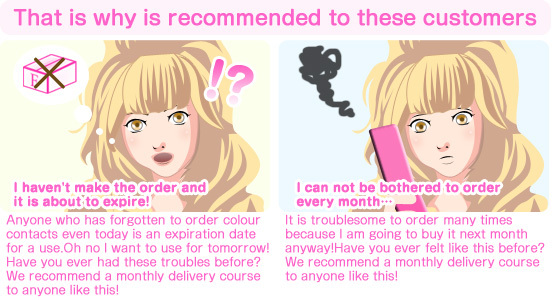 Monthly delivery course is a system that you literally receive colour contacts on the designated date. The delivery date is based on the first date that you receive a delivery for each month. For instance, the date you received a delivery was on the 10th of this month then the next delivery would be on the 10th of the following month. We have the following payment method for a monthly delivery course of Fall in Eyez(R) at the moment. What is a stamp card? 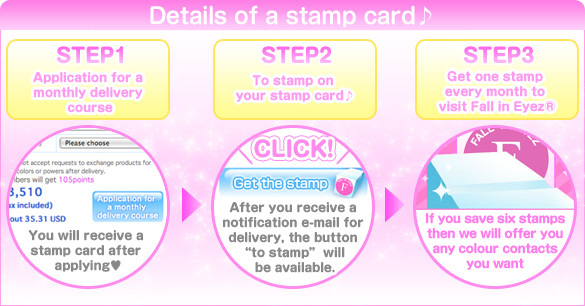 A stamp card is a limited card for only customers who have been using “ a monthly delivery course” of Fall in Eyez(R). We would like to offer a set of Fall in Eyez(R) colour contacts you like(with power or without power) if you save six stamps which allows you to get one stamp for each month! The stamp is not automatically added. Please press the button “to stamp” via either top site or a list of a membership monthly delivery course. The term that you can get a stamp is for 31 days. Please check out a notification e-mail for delivery which has information. If you get one stamp every month then you will be able to GET a set of colour contacts after 6 months at the earliest! If you save six stamps then the button for a present will be available. Let’s choose your favourite colour contacts from a list of present and get ones! If you save six stamps then you will receive a new stamp card!